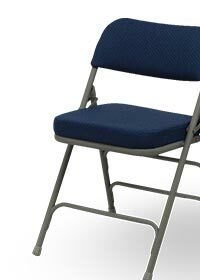 FoldingChairs4Less.com offers the widest selection of plastic, metal, wooden, resin and upholstered folding chairs, as well as folding tables, including blow molded and banquet tables at the lowest prices nationwide. With 3 distribution centers and 1.5 million square feet of warehouse space, many products are in stock and ready to ship. Featuring more than 3,000 products from around the globe, our buyers focus on bringing you the most up-to-date trends in the folding furniture industry. Folding Chairs 4 Less carries everything you need for any occasion large or small, from a complete line of folding tables to hundreds of folding chairs in the latest styles and dozens of colors and chair dollies to transport and store them. Custom upholstery and personalized embroidery services are provided in-house by our expert staff. Our mission is to provide an incredible selection of folding tables and chairs for your special events and everyday occasions at unbeatable prices with fast delivery and excellent customer service.